Nuby Printed 4-Piece Nail Care Set | Blue | Essential set for providing safe and simple grooming of your baby. Improve the state of your baby's hygiene by getting this nail care set. It consists of a nail clipper, a pair of scissors and two nail files. Each one is designed in a user-friendly way that helps you to hold them firmly while grooming your child. Feature 1 : Essential set for providing safe and simple grooming of your baby. Feature 3 : Specially designed for your little baby whereas it is easy to use by adult. 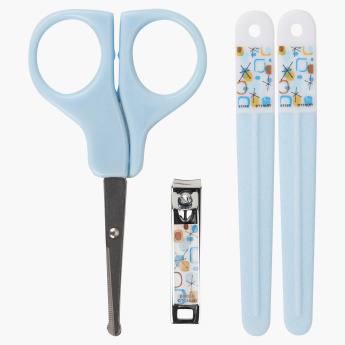 Set Includes : Nail Clipper, Stainless scissor and Plastic File. Feature 2 : Comes with nail clippers. Stainless scissor and unique plastic nail file.